(1) Upcoming Shabbat, Solidarity Shabbat, Saturday, Nov. 3, 10:00 am – We will gather for prayer, ritual and connection as we do every Shabbat. We will also be part of a convening throughout the Jewish world, as communities across North America will be gathering to honor the victims of last Saturday’s tragedy and to support one another as we navigate these difficult times. At Havurah we will largely follow the usual rhythm of Shabbat morning but will create opportunities for reflection, both internal and shared, and direct intentions for healing and strength throughout the service. Whether or not you are a regular participant on Shabbat morning, please come join us as we gather in solidarity – with the Jewish community of Pittsburgh, with the Jewish People as a whole, and with all people everywhere who are vulnerable. Other measures on the ballot also need our attention. Please read your voter pamphlet and make sure to vote! Click here for more information. While over the years we have taken positions on ballot measures, we are aware that there is not always consensus within our community. We will be clarifying our process for taking political positions over the next 18 months. If you are interested in helping to develop that process, please contact Tikkun Olam Lead Chris Coughlin. (3) Pages and Pixels: The Book Smugglers and Aftermath, Sunday, Nov. 4, 4:00 pm, Neveh Shalom, 2900 SW Peaceful Lane – During the coming months, the Portland Jewish Book Celebration will explore this year’s book choice: David Fishman’s award-winning The Book Smugglers: Partisans, Poets, and the Race to Save Jewish Treasures from the Nazis. Told with an historian’s precision and a storyteller’s art, The Book Smugglers brings to life the ghetto residents of Vilna, "The Jerusalem of Lithuania," who risked their lives to save thousands of Jewish books, letters, manuscripts, and cultural artifacts from the Nazis and then the Soviets. The Nov. 4 event is the first of several discussions, and participants will also view the 2011 film Aftermath (Poklosie). Learn more about all Portland Jewish Book Celebration events, including the event Havurah is hosting, on this flier. Image above is from the movie Aftermath. (4) PHFS New Volunteers Orientations for the Family Winter Shelter, Lents or 13 Salmon, Monday, Nov. 5, and Thursday, Nov. 16, 530-630 pm, New PHFS Building, 6220 SE 92nd Ave – This orientation is at the new PHFS home, so you will not only learn about PHFS and the work they do, the volunteer positions available, yet also be able to see where their new building is. These orientations have very limited spaces. If interested, please RSVP as soon as possible to Bethany Rocci, PHFS Volunteer Coordinator, or Havurah PHFS Coordinator Gloria Halper, losninos6@gmail.com. (5) Mikvah Learning Session, Wednesday. Nov. 7, 11:00 am-12:30 pm – A mikvah is a Jewish ritual bath, which has “living waters” sourced from rain. People immerse in a mikvah to mark and sanctify transitions. At its core, this ritual is a sensory way for us to connect with ourselves, our ancestors, the divine, and the water cycle of our planet. Come visit the brand-new community mikvah, Rachel’s Well, and consider how engaging with this ritual can enhance our Jewish lives and identities (no immersing this time). Maximum of 12 people can enroll. Please RSVP here. (6) Focusing on the Most Important Things in the World: Standing for the Amidah, Wednesdays, Nov. 7, 14, 28 & Dec. 5, 12 & Jan. 2, 9, 7:00-8:30 pm – An in-depth, word-by-word study of the Amidah, a key prayer found in all services, exploring the themes embedded in the Amidah section as well as core questions of Jewish prayer and spirituality: What does it mean to be connected to our past? What is power? How do we decide what is most important? What are the relationships between humans, God, the rest of nature? How do we come to give thanks and feel abundance? Why pray, anyways? Being able to sound out Hebrew words (slowly) is needed for this class. Register by Oct. 30. Taught by Deborah Eisenbach-Budner. RSVP here. (7) Brown Bag Lunch with Rosalyn Kliot, Thursday, Nov. 8, 12:00-1:00 pm, 724 OJMCHE, NW Davis St – Noted artist and author Rosalyn Kliot will share her story, from origins in Vilna (now Vilnius) and Lodz, to her life in Oregon today. Questions? Contact Ruth Feldman at ruthtenzerfeldman@gmail.com. (8) New & New-ish Member Tea & Salon, Sunday, Nov. 11, 3:00-5:00 pm – In the spirit of Panim el Panim, or “Encountering One Another,” the Havurah Welcome Team would like to invite new Havurah members, those new-ish to Havurah, and those who may be interested in joining Havurah to an afternoon of storytelling, noshing, schmoozing, and learning more about our community from Havurah members and leaders in an informal setting. Families are welcome, and childcare will be provided. Please RSVP here. Questions? Email stefhausman@gmail.com. (9) Death Café at Havurah, Sunday, Dec. 2, 10:00am-12:00 pm – At a Death Café folks gather to converse about the ever so many aspects of dying and death, including but not limited to end-of-life paperwork, the multitude of feelings about caring for one who is ill/dying, what might a good death look like, grieving, celebrating and any/everything else this topic inspires for you. This is not a therapy or counseling group. Feel free to speak or just listen. Or both. Completely confidential. For those who are 21 and over. Refreshments will be available. Please join us. RSVP here. Questions? Email Buff Medb Neretin at aurorasilks@gmail.com. (10) Calling for B’nai Mitzvah Mentors – As Havurah membership grows, the B’nai Mitzvah Committee is eager to add additional mentors to guide families through the b’nai mitzvah process. Mentors help brainstorm ideas, plan, reassure, and support the family as they progress through the various stages of preparation and planning. Through the b’nai mitzvah years with their own families, most mentors are connected to Havurah, are organized and proactive, and enjoy supporting others who are going through this unique journey, especially for the first time. Would you like to be a mentor? Or do you know someone who might be a good mentor? If so, please write to the committee’s mentor coordinator, Amanda Coffey, at akcoffey23@gmail.com. (11) Have a Question About Havurah? – The Transparency/Inclusivity Committee welcomes your questions about Havurah! We will find the answer and publish the question (but not the questioner) and answer in an upcoming Hakol. It is our intention at Havurah that what you know and understand about our congregation should not be a function of who you know. So if you find yourself wondering about something related to Havurah, or if someone shares their question with you, we hope you will remember to send the question to transparency@havurahshalom.org. For more information, email Judy Steinberger at jlasteinberger@gmail.com or Fran Weick at weick2@yahoo.com. (12) “Universal Human Rights in Our Schools” Fundraising Lecture & Dinner, Wednesday, Nov. 14, 6:00–8:00 pm, Szechuan Chef Restaurant, 3551 SW Macadam Ave – The Wholistic Peace Institute is hosting a fundraiser to support the Torah for Justice, Torat Tzedek, an NGO that defends the human rights of all Israelis and those under Israeli control, advocating for Palestinians, socioeconomic justice for Israelis, African asylum seekers, and Israel’s Negev Bedouin citizens. The speaker will be Torat Tzedek Director/Founder Arik W. Ascherman, a well-known leading human rights advocate and symbol of hope to many Israelis and Palestinians. Learn more here. 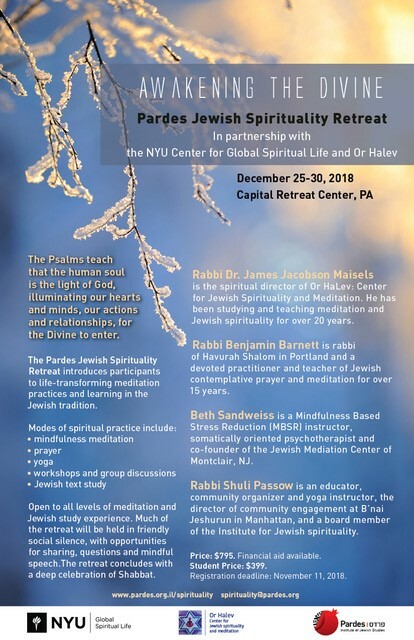 (13) Awakening the Divine, Pardes Jewish Spirituality Retreat, Dec. 25-30 – Rabbi Benjamin will co-lead this five-day retreat on the East Coast in December, alongside other skilled teachers of contemplative Jewish practice. Rabbi James Jacobson-Maisels, the retreat’s lead teacher, is one of the foremost teachers of meditation in the Jewish world today. This is Rabbi Benjamin’s fourth year teaching at this retreat, and he would be happy to answer any questions for those who are interested. You can learn more on this flier. (14) Jewish Community Orchestra Concert, Sunday, Nov. 18, 3:00 pm, MJCC, 6651 SW Capitol Hwy – Join the Jewish Community Orchestra for their first concert of the season, featuring the world premiere of "Endgame," a commissioned work composed by David Avshalomov, son of Jacob Avshalomov, former director of the Portland Youth Philharmonic. The orchestra will also play Bizet's "Roma Suite" and Smetana's "Ma Vlast No 4 - Forests and Meadows." Tickets are $10 for adults, $8 for seniors and $5 for students. Children under 6 are free. Tickets available at the door on the day of the concert. Learn more at jco@jewishcommunityorchestra.org.